Gandhi said the scheme would jumpstart the country's economy as the beneficiaries would start making purchases with the money received by them. 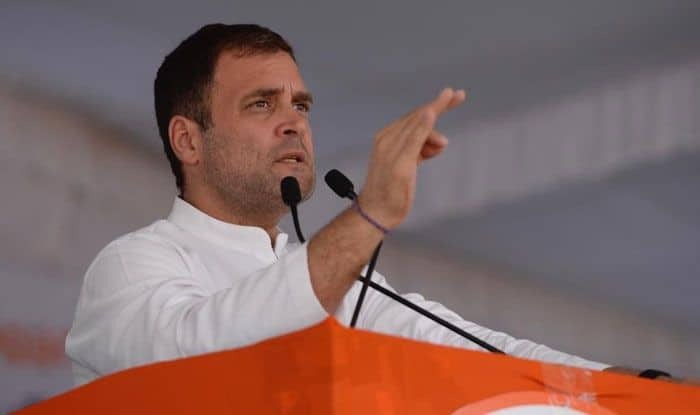 Congress president Rahul Gandhi on Monday said the money proposed to be given to the poor under ‘NYAY’ scheme would be deposited in the accounts of women. NYAY scheme is part of the party’s Lok Sabha election manifesto. “This money would go to the bank account of the woman in the family. Every month, this money will directly go to the bank accounts of women. Crores of women will get power and India would stand on its own,” he said, addressing an election rally at Wanaparthy under Nagarkurnool Lok Sabha constituency. Gandhi addressed three rallies at Zaheerabad, Wanaparthy and Huzurnagar during his campaign in Telangana, which goes to polls in the first phase on April 11. “We guarantee the implementation of ‘NYAY’ scheme (‘NYAY’ yojana ham aapko guarantee karke denge’ in Hindi),” he said. Alleging that Prime Minister Narendra Modi had made the false promise of depositing Rs 15 lakh in the bank accounts of the poor, he said Congress has announced the ‘Nyuntam Aay Yojana’ (NYAY) to ensure that the poor live with dignity. Congress feels that the income of any person in the 21st century should not be less than Rs 12,000 per month, he said. The scheme would jumpstart the country’s economy as the beneficiaries would start making purchases with the money received by them, Gandhi said. He alleged that the economy has been paralysed following demonetisation implemented by the NDA government. If the UPA came to power, 33 per cent reservation would be given to women in Lok Sabha, Rajya Sabha and State assemblies, he said. Gandhi also said 33 per cent of Central government jobs would be reserved for women. At Huzurngar, he said 22 lakh vacancies in the government would be filled up by March 2020. Addressing a rally at Zaheerabad earlier in the day, Gandhi asserted that only his party can fight the BJP and accused the ruling TRS of having a “partnership” with the Amit Shah-led outfit. On his first visit to Telangana after the announcement of the election schedule, he attacked the Prime Minister, saying that while China generates 50,000 jobs every 24 hours, Modi “snatches away” 27,000 during the same time. “He promised two crore jobs (every year). Has anyone of you got jobs?”, he asked and alleged that in the last 45 years, the unemployment rate was the highest under Modi’s five-year regime. Gandhi said that if the UPA comes to power, they would spend six per cent of the GDP on education, building new colleges, universities and institutions and providing scholarships. Alleging a “partnership” between the TRS (Telangana Rashtra Samiti headed by Chief Minister K Chandrasekhar Rao) and BJP, he said Rao never criticised the BJP-led government and supported it on issues like the GST and demonetisation. “Modi gets help from Telangana. Remote control is in the hands of Modi””, Gandhi alleged. “Narendra Modi is a friend of KCR (K Chandrasekhar Rao)”. “If you vote for TRS, you are giving a vote to Narendra Modi and RSS”, he alleged. “Only the Congress can fight against Narendra Modi and RSS. If Narendra Modi loses sleep at night, it’s because of the Congress; if there is fear on the face of Narendra Modi, it’s because of the Congress”. He said everyone knows that TRS is not fighting against Narendra Modi. “Only Congress is fighting and not TRS and only Congress can fight them; we cannot be bought”. Gandhi alleged that Modi always helps 15-20 rich people, and that he waived their loans to the tune of Rs 3.5 lakh crore during the last five years. “He (Modi) only spreads hatred and anger wherever he goes and makes false promises”, he said.